Early Readers are stepping stones from picture books to reading books. A blue Early Reader is perfect for sharing and reading together. A red Early Reader is the next step on your reading journey.Janey is fed up of being told what to do by her mum and dad. 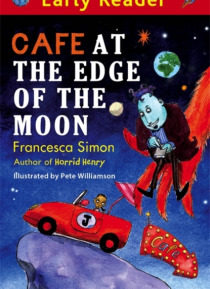 So she jets off to the cafe at the edge of the moon where she can do anything she likes - eating pudding first, splashing in puddles and racing… a dinosaur.